This is Money Mail 43 and we’re working on the theme of Abundance! I am love. I am abundance. I am the treasure. Find the image to use as your phone lockscreen here. Repeating these words out loud, and confidently, will gently shift your energy and keep you focused on this work. 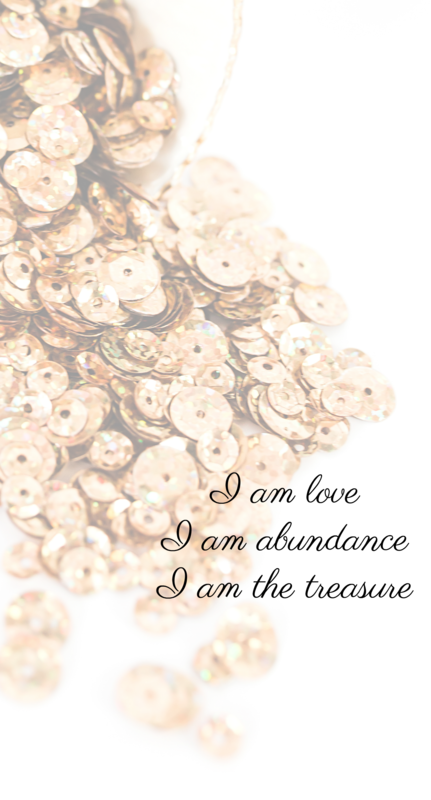 The affirmation works best if you repeat it three times, three times a day for the month we’re working on abundance. What’s your mind's automatic expectation that comes with abundance? We talked about ‘burdens’ in last month’s theme of self-actualisation. Now let's find out what burdens come to you packaged up with abundance? Have a think, make a list. Thoughts: Same as the beliefs above. Feeling deserving doesn’t always come naturally. What do you think you have to do in order to deserve abundance? Close your eyes and ask yourself: What do I have to do in order to deserve abundance? Thoughts: Do the beliefs above as Thoughts too! Everyone can find the Limiting Belief Release Technique here. Have fun digging into those, and I’ll be back with you next week.